I recently got back from a camping/photo trip in the northern Maine woods with my good friend Garrett Evans, shooting the night sky from some new, unique locations. 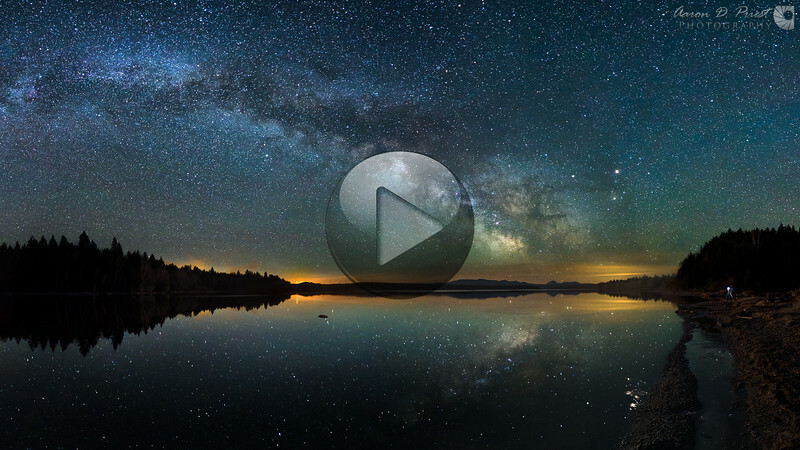 This is the Milky Way reflecting in Round Pond on the Allagash Wilderness Waterway with Mt. Katahdin in the distance. Even to the naked eye the reflection of the stars in the water was amazing! To the left is Chamberlain Bridge, to the right is Garrett shooting along the shore, and near the center is a 48% moon rising. The first spherical panorama took a few days to blend and stitch as it’s really three panoramas blended together: I shot the sky at 17 seconds for sharp stars, the reflection at 30 seconds to make it a little brighter, and one minute exposures of everything else at a lower ISO after the moonrise for more foreground details, as well as separate frames of the moon and Garrett. I merged the exposures separately for each frame in Photoshop first with a combination of Raya Pro and luminosity masks, aligned everything with PTGui Pro (including the two separate exposures of the moon and Garrett), and then blended everything together manually via masks in Photoshop. As a result there were a lot of layers and the .PSB file is about 12GB before flattening. The boat launch panorama was actually taken first as a test. I decided to re-locate around the bend for a better reflection and view of the mountains afterward. I kept this panorama because I like the wharf and canoes, and I had captured seven Eta Aquarid meteors--see if you can find them! Camera settings: 14mm, f/2.8, ISO 5000, 17 seconds for the sky & ISO 5000, 120 seconds for the ground. Stitching data: 24 images merged into 2 rows of 6 columns and aligned with PTGui Pro. Blended with Photoshop. Check out the rest of the photos in the gallery below.